Nothing too eventful this year, no shootings, no colors, nothing more than a broken shifter arm, lost glasses, and lots of great riding. Luckily one of my friends was able to repair the shifter arm. No such luck with his glasses. Something to remember: when you're flying down the highway at 75 MPH, you should never open your windshield bag for anything because things, glasses, tend to fly out. We had some great meetings with some builders and other general contractors that had good advice and great leads. We watched people, met people and looked at the menagerie of bikes and bikers. Instead of taking two days back to Portland this year, we took three. We wanted to check out a new route and go by Crater Lake. It was incredible. Although I was a little pissed that the best motorcycle road I've ever been on had construction happening and we had to follow a pilot car for about twenty miles, still it was gorgeous. I'm ready to ride it again next season without the construction. For you Oregonian riders it's State Road 138 from Crater Lake to Roseburg and it's fantastic! It's full of great curves and beautiful scenery. It goes through the Umpqua National Forest, and that's one beautiful forest. I can't even begin to tell you how many forests we went through, although I don't really understand how a desert can be classified as a National forest. Now for a few pics of the trip! Long Horns in Oregon, really? I'm so glad I pay for vacations and such a year or so before I take them. 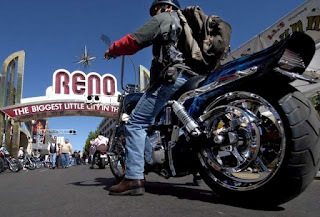 Next Tuesday I'm leaving for Reno for a rally called Street Vibrations. 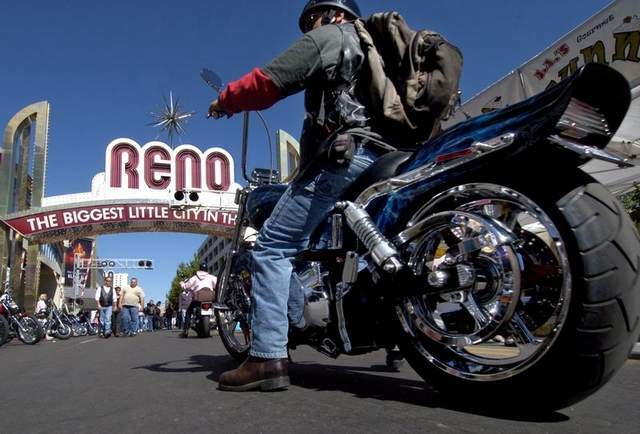 It's the fourth largest motorcycle event in the country. The reason I'm glad I've already paid the non refundable fees is that this year I'm flat broke. We missed almost six months of work, but it seems to be picking up some.....fingers crossed! The group leaves Tuesday the 18th and will be home the 25th. 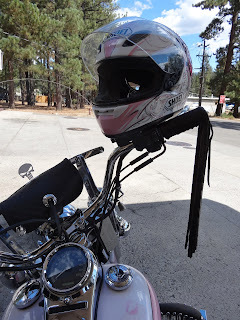 It's usually a two day ride to Reno but on the way home we're going to take a different route and go through Crater Lake Park. That will turn the 2 day ride into a 3 day ride. Thank God for cell phones and the Weather Channel app! If it even looks the least bit cold at Crater Lake, elevation of around 7000 feet, there's no way in hell I'll be riding through it, even with my heated gear. I'm kind of wondering how this year's rally will go. They've made it into a "no colors" event, which means the clubs, better known to the public as gangs, won't be able to wear their "cuts," their vests proclaiming which "club" they belong to. Street Vibrations has traditionally been claimed by the Hell's Angels and their support clubs. Sometimes other clubs try their luck and show up. At last years event a member of the notorious club called the Vagos (look 'em up, their some pretty bad dudes) shot and killed a Hells Angel chapter president in a casino firefight and the war was on. The next day an Angel shot a Vago. This years dress code is pretty strict, down to shoe laces. No club colors in bandanas, patches, wrist bands, shoe strings, etc. Which leaves me in the lurch, some of the bandanas I usually take are red and white, the colors of the Hell's Angels. It's going to be interesting to see what takes place this year and if they're able to keep the clubs at bay or if the clubs will rebel and show up in full force. Either way it will be interesting and a much needed time away. I'll try to post some pics along the way. 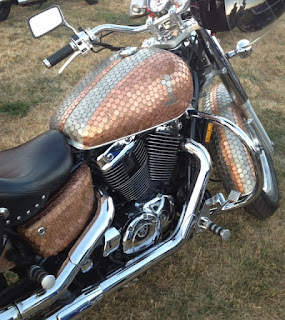 It's a beautiful ride and the event itself is pretty cool, well, if you like motorcycles. I love the biker culture. I love that a biker will help another biker at any time for any reason. I love that everyone that rides is a "brother" or a "sister." I love the sounds of bikes, I love the looks of bikes. I love the leather and the tattoos. I love the diversity and I love the respect bikers show for each other. There is one part of the culture that I really don't get, or maybe I don't want to get. I was sitting at a bike event tonight listening to the band. It was the perfect night for a gathering, the weather was warm and dry and everyone was still celebrating summer. As we sat there I watched the girls. There are always unattached girls around. Most scantily dressed with their short shorts, tight short dresses, high heels and torn t-shirts. It's easy to see they didn't get there on the back of someone's bike and they certainly didn't ride themselves. They're women hoping to pick up a biker for the night, or perhaps a little longer. They stand out, they really stand out. In the world of the biker these girls are called "pass arounds," for obvious reasons. There are also what's called "biker babes." In the words of a "club" member "a biker babe enjoys the lifestyle, has morals and will gut you for unwanted advances," and "a pass around welcomes them." While the band played the pass arounds danced seductively to the music all the time holding tightly to their beer. They were doing their best to be noticed and hopefully picked out of the crowd by anyone that would give them the attention they were seeking. They are as young as those in their twenties and as old as late fifties, early sixties. I took pictures but decided not to post them. It was sad watching them do their thing. Watching those lonely women do everything in their power hoping to be noticed by someone that would most probably give them what they wanted and throw them away a few hours later was very sad. I know there are people like that in every arena of life, but for some reason the biker world seems disproportionately filled with them. The girls are at every event, every gathering, every rally, and every biker bar. On another note, check out this bike. It is covered with pennies and nickels. Strange, very strange. Someone had a little too much time on their hands it appears. But in a way it's kind of cool being so different. Then there's this shot I like. Before I knew it, it was there. There was no notice, no "Hey, I'm running by," nothing. It had been a perfectly beautiful motorcycle ride. The September air was warm and the feeling of autumn was far away. There were no clouds, the mountains could be seen for miles. My friend and I had been riding through the countryside of Washington, going to get a peek of Mt. Adams. We hadn't a care in the world and were thoroughly enjoying every second of our Sunday ride. Then it happened. It was so fast that I didn't have a chance to react. Out of the corner of my eye I saw a brown fluffy tail, then felt a thump, a thumb beneath each of my tires. I couldn't look back, I couldn't look in the mirror. It had to have died. Then a terrible thought entered my mind, what if I'd only injured it? My friend was right behind me and I knew he would also feel those thumps, then it would surely be dead. I couldn't get it out of my mind for the next half hour. I couldn't believe I hit something, I couldn't believe I killed something. No matter what I tried to fill my mind with, thoughts of the horrible act kept creeping back. Finally we came to a stop. I got off my bike and pulled off my helmet. As I was shaking out my hair he walked up to me. I asked him if he saw what had happened. As only he can do, he began laughing so hard I thought he might actually have a heart attack. As his laughter subsided he managed to get out, "Teri you NAILED it! It jumped out of the woods, ran into the road and BOOM, you killed it! Then I hit it, so I'm sure it's dead." "What do you mean what was it? It was a squirrel, what did you think it was? Sasquatch?" I could feel my eyes stinging with tears. "Teri, it was a SQUIRREL!" "I know, but there's probably squirrel guts all over my bike!"